At first glance, The Wet Brush looks like an ordinary hair brush, but with just one use, women, men and children will learn why it’s the world’s best detangling brush! Used on wet or dry hair, The Wet Brush quickly and painlessly detangles even the thickest, most stubborn hair thanks to its revolutionary bristles. Specially formulated, The Wet Brush’s IntelliFlex bristle is designed to be ultra thin and flexible, yet still have rapid recovery memory to instantly bounce back to its original form. In addition, the ball tip bristles provide a massaging action that stimulates circulation at the follicle and is a proven benefit for hair health. 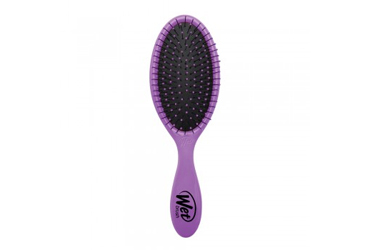 With a rubber coated non slip handle that feels great wet or dry, The Wet Brush is a favorite among women, men and children of all ages and can even be used on extensions and wigs. Perfect for use in the shower, after a shower, at a salon, on a beach or on children who cringe at the sight of a hair brush, The Wet Brush allows anybody to have beautiful, soft, healthy and tangle-free locks. Thanks to The Wet Brush, detangling the toughest knot has never been so effortless.